I have a feeling, they are making a lot of money and the husband wouldn't mind it as well as long as there is beer! You got a good eye :). Most husbands wouldn't mind at all being in that creche. "Everything's all Sir Garnet" can be aptly said in this context. Hehe .. had to show it to my hubby dearest ;) He loves the idea.. i'm still not sure if I do. Good capture! Shruti: :-) I guess all guys will love it. Is it a garment shop for ladies?? Brillant idea. Come to think of it, how come its not a big global business as there is a crying consumer need for it. Suited to each culture perhaps - Pub in the UK; maybe cricket telecast in India ? Had a good laugh anyways;-D!!!!! Reflections: Even i had to google Sir Garnet but I knew where it was :) :) heh heh. where else will husbands sit quietly and not make a nuisance of themselves? Had a good laugh! At least I came to know who Sir Garnet was? That was a nice click ..
Miss.M :-)Welcome to my blog. This is a wonderful idea! 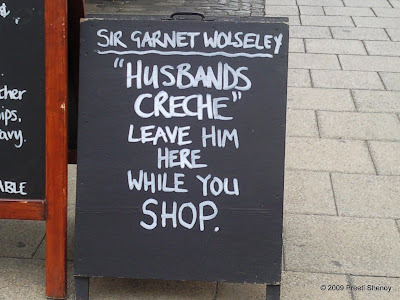 I love the idea of having a nice safe place to tuck the hubby away while shopping. Ha..ha..ha.. Good one. Every woman's dream. I hope you remember me. You had commented on my poem, (on my blog www.mistressofart.blogspot.com) a couple of months back. I am so thankful to you for doing that! Because of your comment, I felt very encouraged, and have 10 published pieces to my name today! Now, I work for an online newspaper, and want to interview you, for their interview column. The site is 'theviewspaper.net'. I hope you oblige to my request! This one was too good. Wish they had such pubs everywhere :-) Sir Garnett must have become quite 'popular'in google now! You are an amazing writer. Keep up the good work.